Exploration of the tea plantations in Shizuoka is rewarded with stunning views, and insight into a unique way of life, far removed from urban Japan. 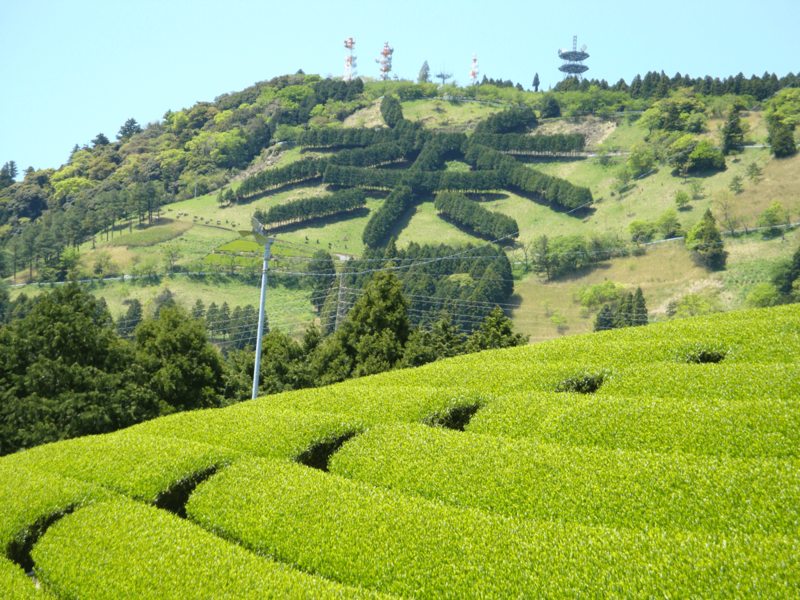 Shizuoka tea plantations are the driving force behind the region’s rich history and culture of green tea cultivation. They are also a photographer’s dream and many of them have to be seen to be believed. These rows of luminescent greens pour down the mountain slopes much like the pure waters of the rivers and streams that carve out these areas of cultivation. 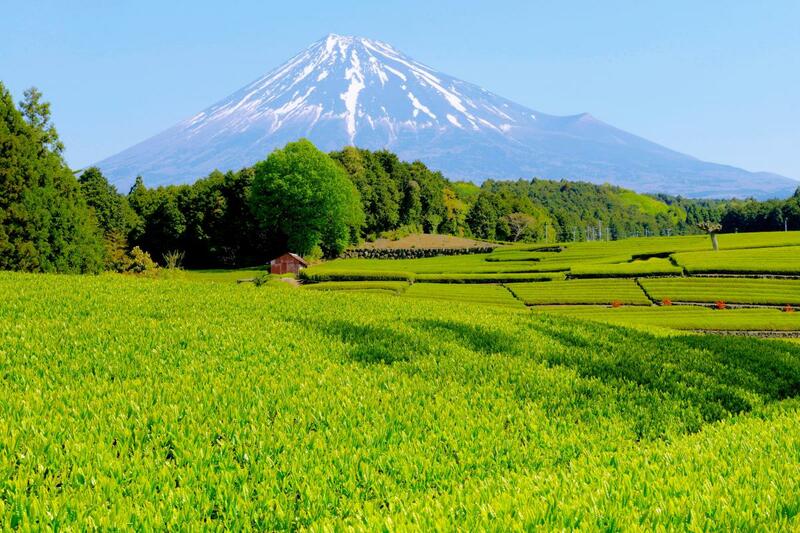 Shizuoka plantations reward exploration with staggering views, unique local culture, and refreshing cups of green tea that will reinvigorate those tired legs! A single glance to take in the contrast between this amazing tea plantation and the looming backdrop of Mt. Fuji is all you need to set the hairs tingling. It’s hard to image a more quintessentially Japanese scene, that this Fuji City plantation lays on. The best photo spot is to be found around 300 m from the Fuji Art Village (富士芸術村). There are signs pointing the way from the village. The green tea grown at Sasaba benefits from the invigorating atmosphere found at the base of Mt. Fuji and the nourishment provided by this area’s pure waters. Known as Fuji No Yabukita Cha the tea is also, and accordingly, known throughout Japan. From JR Fuji Station take buses bound for ‘So Bina’ (曽比奈). Get off at ‘So Bina Shita’ (曽比奈下). It’s a 10-min walk from the bus stop. Located upstream of the Okitsugawa River at an elevation of 250 m and commanding a view of Mt. Fuji you’ll find this quiet and almost ethereal mountain hamlet. Hanging off precipitous slopes and surrounded by abundant nature, the plantation terraces of Ryōkōchi present a view that is almost overwhelmingly beautiful and has to be seen to be believed. Amidst this undulating terrain and the ghostly mists rising from the river, the tea grown at Ryōkōchi is famed for its delicate flavor, a bit like the conditions under which it is grown. From JR Shimizu Station take buses bound for ‘Tadanuma Shako’ (但沼車庫). Get off at the final stop (‘Tadanuma Shako’ (但沼車庫)) and change to buses bound for Ōhira (大平). Get off at Terao Jima (寺尾島). Ryōkōchi is a 10-min walk from the bus stop. 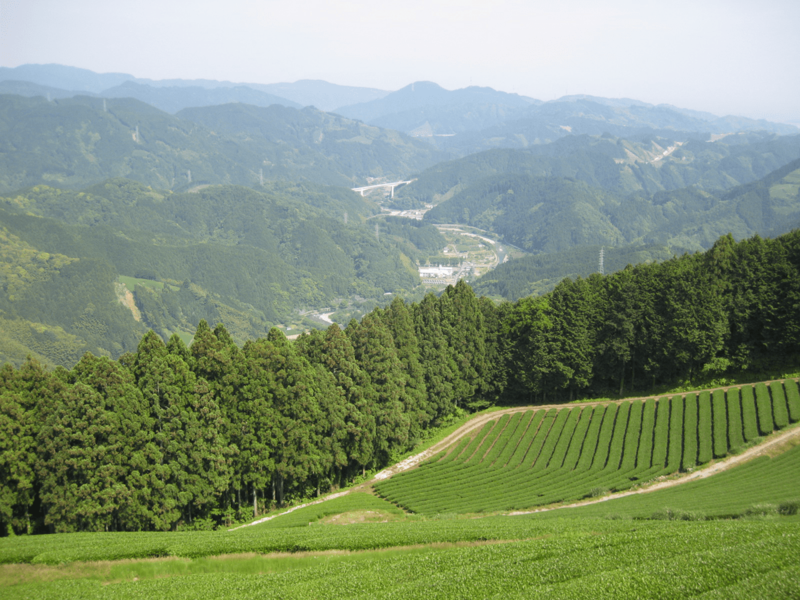 The Kawanehoncho green tea production area spreads out across a ravine created by the waters of the Ōi River which flow down from Japan’s Southern Alps. 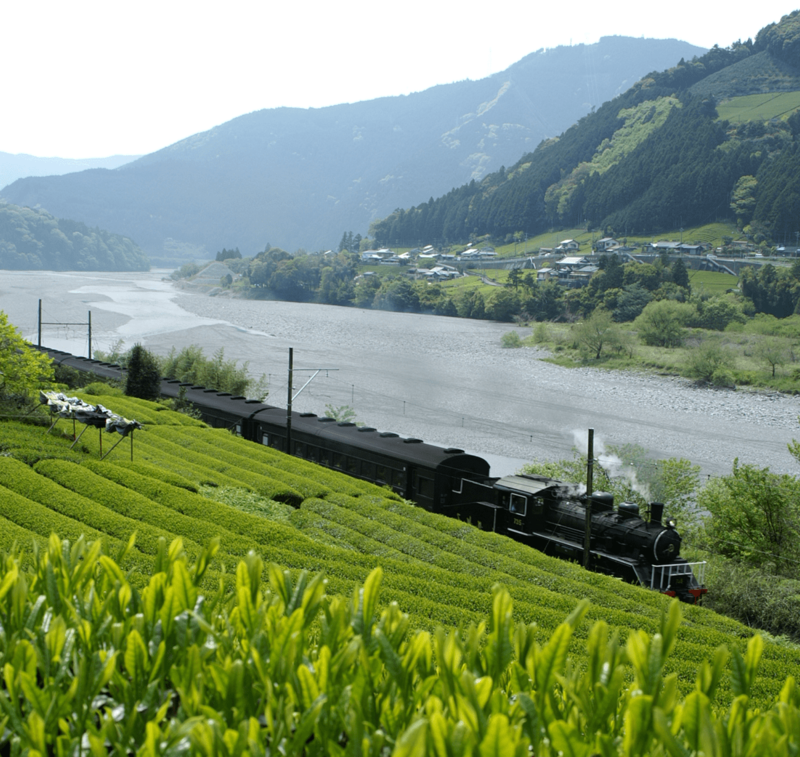 It’s in this dramatic landscape that visitors can gaze out at precipitous tea plantation terraces from a steam locomotive that plies a course alongside the river. The morning dew created by the mountains envelopes the tea leaves here creating the mild taste for which the tea they produce is famous. Catch the steam locomotive (Ōigawatetsudō / 大井川鉄道) from Shin-Kanaya Station. Get off at Suruga-Tokuyama Station for Kawanehoncho. Near to the station, the Faure Nakakawanechameikan Rest Area (open 9:30 - 16:30) will make a good base for your explorations. Here you can learn about the culture and history of the tea produced in the area, and, of course, taste it! Mt. Awagatake towers over the northern Shizuoka region of Kakegawa-shi. On one of the mountain’s slopes a massive kanji character representing ‘tea’ (茶 / cha) measuring some 130 m on one side is drawn out with trees. The area around this character is home to some beautiful tea plantations as well as abundant wildlife, all protected by the area’s status as a designated World Agricultural Heritage for the tea production methods employed here. You can find information about the local area at the Higashiyama Ippuku store (東山いっぷく処) (see map). From the store, it’s a fairly relaxed one-hour hike to the top of Mt. Awagatake. The city of Kakegawa operates a bus service to the Awagatake ‘tea’ character. Services depart from Kakegawa Station. Get off at Higashiyama (東山) bus stop. JR Tokaido Line services run between Shizuoka and Kakegawa Stations. ~ 45 mins / 840 yen. Kodama Shinkansen are another option between the two stations, making the journey in around 13 mins / 1,700 yen (unreserved seats).